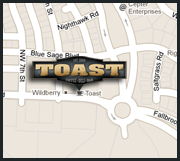 Welcome to Toast, your neighborhood restaurant and local watering hole. Inspired by the time-honored European cafe bar, Toast is a highly caffeinated hybrid that combines perfectly poured premium ales, a first class selection of fine wine and aged spirits while offering a classic delicatessen. For any questions or comments please feel free to call us at 402-261-8859. We are always seeking exceptional individuals to work in our fun-loving business. If you are creative, energetic and highly motivated and ready for a job that rewards hard work, then Toast is for you! Please click here to download the attached employment application and bring it by the Restaurant.